BatchTron I, a low-cost batch controller embodying features of the larger II & III versions, is a PLC/touch-screen system that can replace more expensive PC-based controllers. Directed at simpler applications, such as portable or transit mixed concrete plants, BatchTron I can store 1,000 mix designs and handle up to two scales, plus six aggregate, three cement, two water and six admixture sources, with direct feed or inclined belt from aggregate scale to mixer. ITW Muller has announced new service agreement pricing, noting substantial savings compared to normal service rates. The agreement provides customers a fixed cost maintenance program with the same technicians who manufactured the equipment. A new literature sheet is also available detailing the various service programs offered, including equipment audit, labor only and parts and labor programs, with pricing available for each. The literature also includes a rate chart comparing standard rates to ITW Muller’s service agreement. Manufacturer’s 825-CBW is a compact, yet complete control package for continuous weighing of bulk commodities in a shipping or receiving installation, featuring customer and product identification, single or multiple loading, and ship or receive mode. It recently passed NTEP legal-for-trade evaluation and certification. Manufacturer has extended its Lo-Pro series with the 327 mobile batch plant, and introduced a 410-barrel mobile cement storage bin and 58-ft. long, single-axle conveyor. The batch plant offers 327-barrel, in-truss cement storage, with an available additional 400- or 565-barrel cement storage component that mounts directly on the plant. The plant also features the Lo-Pro “blending” cement batcher and “live bottom” aggregate batcher for improved concrete mix quality, plus 180-degree mixer truck charging access. Company’s Type J-AL aluminum access doors are now available with standard stainless steel hardware, enhancing the corrosion-resistance of the product and performance in corrosive environments. Delivered in a single- or double-leaf design and reinforced for 300 PSF or H20 loading conditions, Type J-AL doors provide access to underground areas, including water and wastewater treatment facilities, pump stations, commercial and institutional buildings, and public utilities. The three-step/three-component Hydrostop Restore & Protect system, product developers note, will repair and extend the life of aging concrete infrastructure and buildings; suits above-grade concrete structures exposed to harsh environmental conditions; avoids immediate replacement of deteriorated, but sound structures; and, reduces long-term maintenance costs. Head Joint and Heritage blades offer controlled cuts and precision for mortar removal on vertical joints and very narrow mortar joints, and are available as aftermarket accessories for the company’s AS170 Brick and Mortar saw. With a 3⅛-in. cutting depth and ¼-in. cutting width, the Head Joint blades suit cleaning out vertical mortar joints. The Heritage blades’ reduced cutting width of ⅛ inch and their level of precision and control, make them ideal for cleaning out the narrow lime mortar joints typically found in historic buildings. Both blades feature the new high performance improved carbide formula and tooth design and high temperature brazing. Authorized Transmission Remanufacturing, Inc., a national supplier of fleet transmissions throughout the U.S. and Canada, has occupied a new 100,000-sq.-ft. plant in Mundelein, IL. The facility provides ATR with the needed space and resources to meet its growing business, company officials note, and has an enclosed cleaning/processing department, sound proof dyno testing area, large remanufacturing area for cellular and rebuilder work stations, employee and customer training room, and a large parts department and warehousing. This Tiger technology assures tight height control and consistency across the production pallet. A valve and encoder work in tandem on each side of the compression head to ensure the head remains horizontally level for consistent height product across the pallet. The head cylinders and guide shafts are located outside of the mold change area to provide stable motion and wider spacing of these components assisting in height consistency control. The new head-locking mechanism provides for stable and rigid head positioning during production. The MultimatRH760 is a new generation production machine capable of producing block in under six seconds, as well as high-quality pavers and sectional retaining wall. It can be installed easily on existing foundations and a special adapter makes it possible to utilize a customer's mold inventory. Well-established German batch plant and mixer manufacturer BHS-Sonthofen will serve U.S. and Canadian customers and prospects from a new Charlotte office, co-located with the domestic base of parent BHS Filtration Inc. Mixing Division Manager Stu Bentley (704/814-7670) will oversee sales and service of a full line of turnkey batch plants, twin or single shaft mixer models; special concrete plant components; and, custom mixing equipment for continuous feed and discharge processes. BHS-Sonthofen cites thousands of concrete plant mixer installations worldwide, and mixing technology development dating to 1888. Incorporating elements unheard of for parking garages, developer Friedman Properties recently opened an 11-story structure in the (downtown-bordering) Incorporating elements unheard of for parking garages, developer Friedman Properties recently opened an 11-story structure in the (downtown-bordering) River North area of Chicago designed for maximum energy efficiency, minimal waste, and roughly 725 parking spaces. PRODUCERS Walter (Jerry) Hoyle has been named president of CTS Cement Manufacturing Corp. in a promotion from his previous executive vice-president position. The Indiana Ready Mixed Concrete Association has appointed Jerry Larson executive director, following two years as the group's northern promotion manager. Inventure Systems can satisfy all your mixing needs. Choose from Inventure's Reversing Drum Mixer to Pemat and BHS Mixers. View Slide Show. John P. Gleason, 66, who guided Portland Cement Association from 1986 until retirement in early-2007, died Jan. 14 after a three-year battle with cancer. 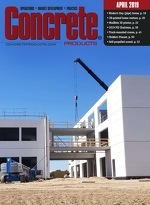 The National Precast Concrete Association (NPCA) will stick to its Preferred Future game plan as it grows in 2008 and launches a new trade show in 2009. A new American Institute of Architects campaign aims to educate, promote and encourage sustainable design among consumers, business owners and architects. The latest addition to National Ready Mixed Concrete Association's flip chart promotion tool series is a comprehensive 20-page effort on flowable fill. St. Louis-based Midwest Block & Brick is developing a 10,000-sq.-ft. office and warehouse facility in Gray Summit, Mo., scheduled to open in early April. Soaring Share Price, S&P 500 Listing Cap Banner Year For Terex Corp.
ELECTRONICALLY CONTROLLED EXTRUDERS Presented as the first in a new line of electronically controlled hollow core extruders, the EM 350 produces a 14-in. Recent restructuring of the National Precast Concrete Association (NPCA) reinvigorated the group, and the new chairman wants to sustain that enthusiasm. Emerging in recent years as one of the improved tools for highway bridge assessment is a structural health-monitoring (SHM) system that uses sensing technology. Will Home Depot Shop Hughes' Concrete Assets? The Lafarge North America-sponsored exhibit, Liquid Stone: New Architecture in Concrete, closed January 29 after 18 months at the National Building Museum. Precast Title Should Be Here: Blah Blah Whatever, Whoever.